When discussing fine timepieces, there are luxury watches and then there are examples of high horology. 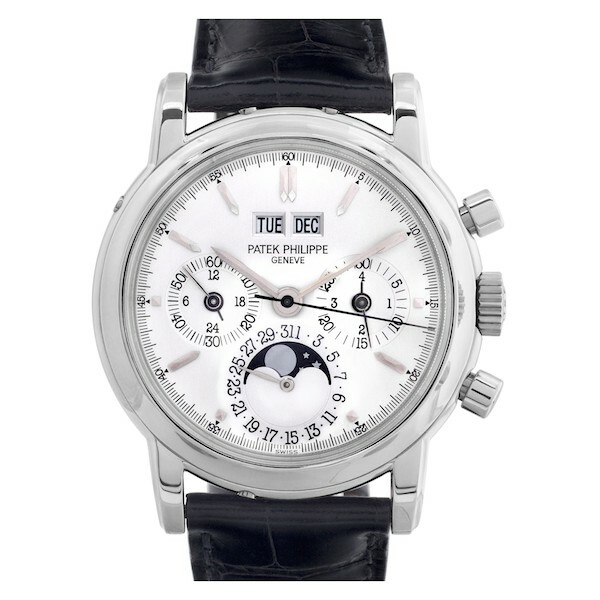 The Patek Philippe Perpetual Calendar Chronograph 3970 in platinum is an exquisite example of haute horlogerie. Not only does it come from one of the most revered watch manufactures in the industry, but the watch also houses a handful of complications and it’s crafted in the most precious of metals. In fact, the pairing of the perpetual calendar with the chronograph is one Patek Philippe’s signature complication combinations. Flaunting a magnificent marriage of looks and technical mastery, let’s dig into the Philippe Perpetual Calendar Chronograph 3970EP. Patek Philippe launched the ref. 3970 in 1986, first as a yellow gold model. 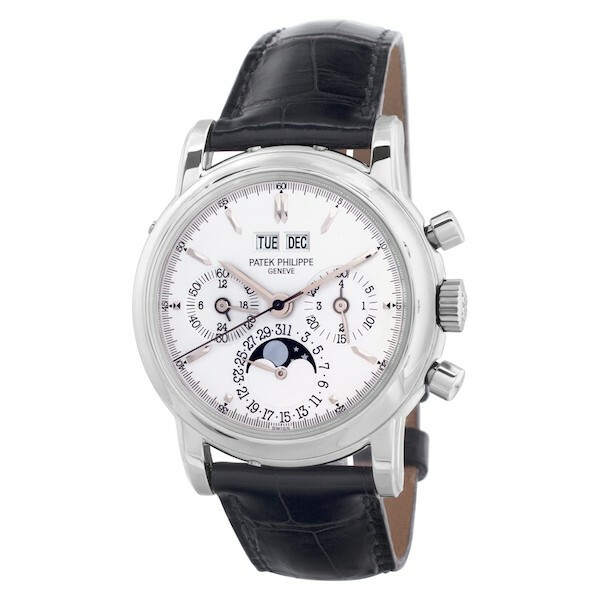 The 3970 was the third reference to join the iconic Patek Philippe Perpetual Calendar Chronograph collection and its production lasted until 2004. 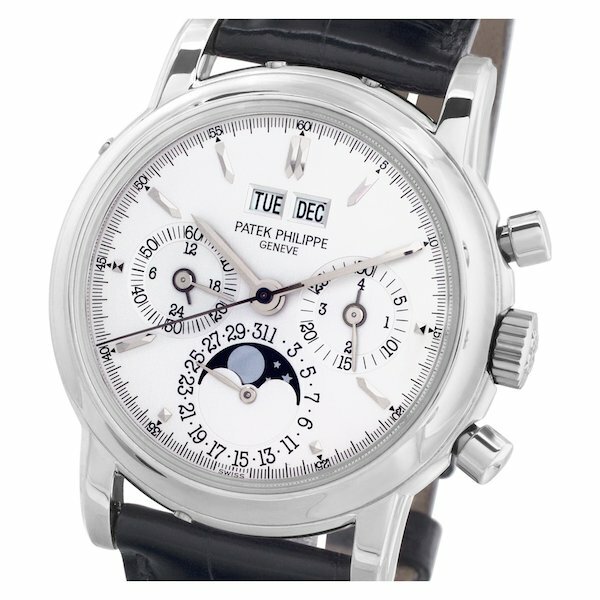 For context, the Patek Philippe Perpetual Calendar Chronograph collection began with the ref. 1518 (the very first serially produced perpetual calendar with a chronograph that dates back to 1941) and continued with the ref. 2499, which Patek produced from 1951 – 1986. Interestingly, with its 36 mm case diameter, the Patek ref. 3970 is sized right in between the 35 mm ref. 1518 and the 37.5 mm ref. 2499. The watch houses the familiar Patek Perpetual Calendar Chronograph dial layout with three subsidiary dials: 30-minute chronograph recorder and leap year indicator at 3 o’clock, date and moonphase displays at 3 o’clock, and 12-hour chronograph recorder and running seconds at 9 o’clock. There is also the duo of windows for the day and the month right under 12 o’clock. Patek made the 3970 in all four metals: yellow gold, rose gold, white gold, and platinum. This particular version carries the 3970EP reference number where “E” refers to “Etanche” meaning “waterproof” and “P” is for platinum. Throughout the 20-year production run of the Patek Philippe Perpetual Calendar Chronograph 3970, there were a few variations in dials, hands, indexes, and casebacks. This example that we’re looking at here circa 2000 includes an elegant silver dial, slim baton hands, pencil-shaped hour markers with pointed tips, and a solid screw-down caseback. 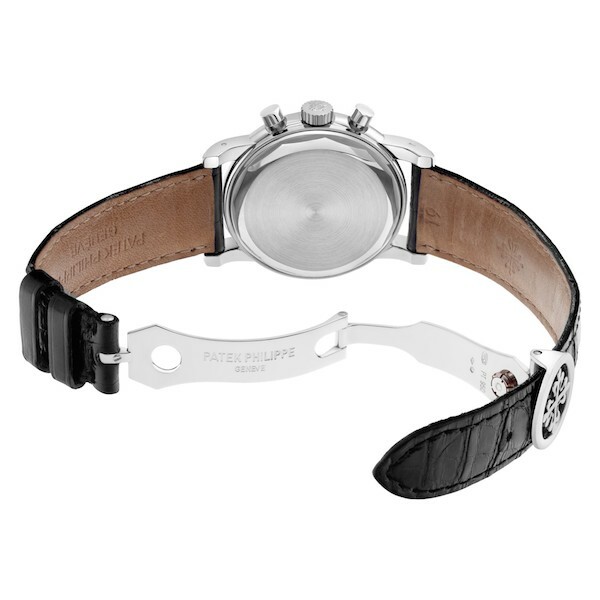 It’s also fitted with a classic black leather strap, equipped with a platinum deployant clasp. Powering the Patek Philippe Perpetual Calendar Chronograph 3970 is the Caliber CH 27-70 Q manual-wound movement with a 60-hour power reserve. 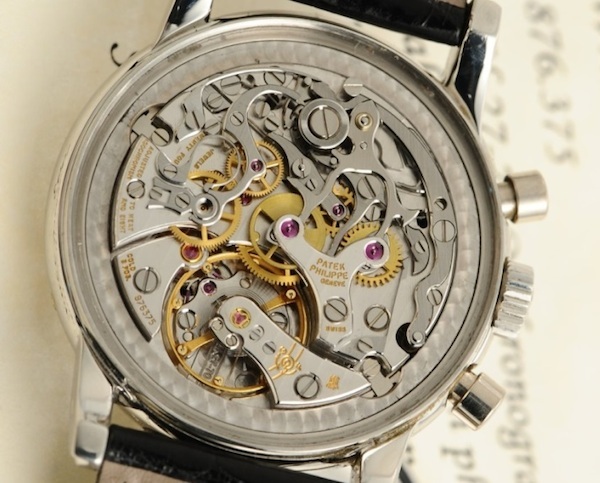 This caliber is based on the Lemania 2310 movement (which was also the base of Caliber 321 used in early Omega Speedmaster chronographs) and the ref. 3970 was the first time Patek used a non-Valjoux movement for one of their chronograph models. In true Patek Philippe fashion, the Caliber CH 27-70 Q is beautifully finished by hand, complete with the coveted Geneva seal. Patek Philippe eventually discontinued the ref. 3970 in 2004 and replaced it with the Perpetual Calendar Chronograph ref. 5970, which has a much larger 40 mm case. The Patek Philippe Perpetual Calendar Chronograph 3970 is a significant reference in the brand’s history and for high watchmaking enthusiasts, it’s a model to covet and collect.